Love jam with your pb but not loving all of the added sugar? 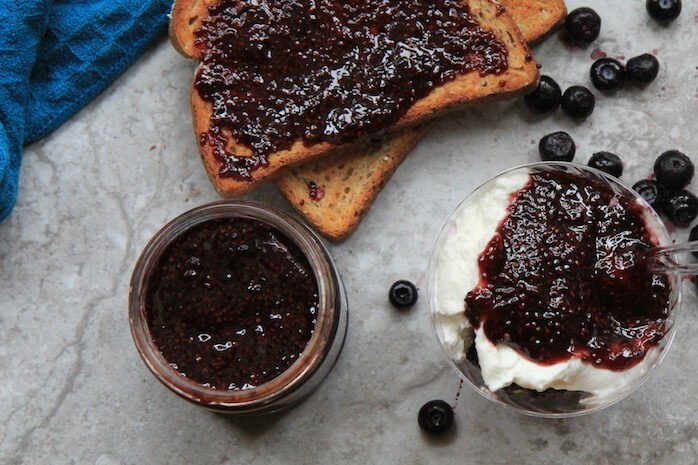 Here’s how to make the easiest and most delicious blueberry jam you’ve ever tasted! All you need is fresh or frozen blueberries, chia seeds to help it gel (and add a healthy dose of protein and fiber to your jelly – other jams don’t have that!) some lemon zest (optional, but yummy) and a bit of water. That’s it, that’s all! Blueberries are a nutrition superstar because they’re rich in antioxidants such as vitamin C for a healthy immune system. Antioxidant-rich foods are linked to better memory and improved learning ability. A cup of blueberries is only 80 calories and provides your daily dose of fiber to support your digestive health and keep you full longer. Plus, blueberries are an excellent source of manganese, a nutrient that plays a role into converting carbohydrates, protein and fat into energy. Chia seeds are low in carbohydrates and packed with filling fiber, protein, and omega-3 fats. Omega-3s may help lower inflammation and promote heart health. One amazing thing about chia seeds is when you mix them with water or any other liquid, the seeds soak it up and form a gel. That means you can make a chia seed egg to use as a plant-based replacement in recipes where eggs act as the binder. It also works perfectly in jam so you don’t need to add pectin or other geling ingredients. Also proud to share that this recipe was featured on SHAPE.com! Did you try this recipe? Please do and let me know what you think! If you're using frozen blueberries, defrost them in a covered saucepan over medium heat or in the microwave. Pour into a glass jar with a lid or an airtight container. Put your jam in the fridge for about 15 minutes to let it set. Your delicious blueberry jam is ready to enjoy!